New York, NY, January 4, 2018—The Children’s Book Council, Every Child a Reader, and the Library of Congress today announced the appointment of Jacqueline Woodson, four-time Newbery Honor Medalist, Coretta Scott King Book Award-winner, former Young People’s Poet Laureate and National Book Award Winner for her memoir-in-verse Brown Girl Dreaming, as National Ambassador for Young People’s Literature. The National Ambassador for Young People’s Literature program, established by the three organizations in 2008, highlights the importance of young people’s literature as it relates to lifelong literacy, education, and the development and betterment of the lives of young people. 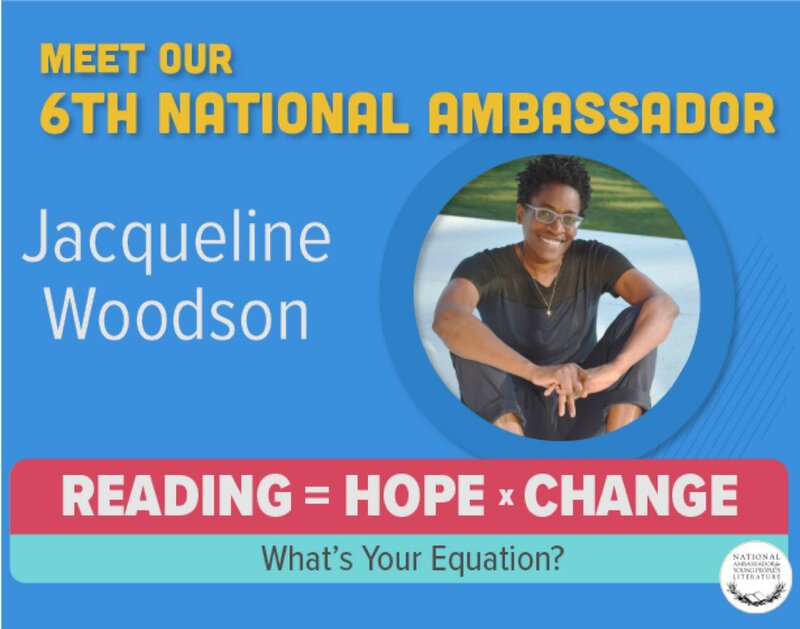 Woodson will travel nationwide over the course of her two-year term promoting her platform, READING = HOPE x CHANGE (What’s Your Equation? ), which encourages young people to think about – and beyond – the moment they’re living in, the power they possess, and the impact reading can have on showing them ways in which they can create the hope and the change they want to see in the world. Woodson succeeds beloved and esteemed authors Jon Scieszka (2008–2009), Katherine Paterson (2010–2011), Walter Dean Myers (2012–2013), Kate DiCamillo (2014–2015), and Gene Luen Yang (2016-2017) in the position. The inauguration ceremony, to be presided by the 14th Librarian of Congress Dr. Carla Hayden and attended by both Woodson and Yang, will take place on Tuesday, January 9 at 10:30 a.m. in the Members’ Room of the Library of Congress’ Thomas Jefferson Building, 10 First St. S.E., Washington, D.C. Tickets are not required for this event, which is free and open to the public. The National Ambassador for Young People’s Literature program is administered by Every Child a Reader. For more information about the National Ambassador for Young People’s Literature, visit read.gov/cfb/ambassador/. 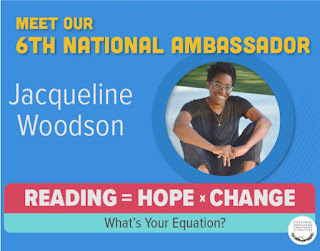 Jacqueline Woodson is the 2014 National Book Award Winner for her New York Times bestselling memoir Brown Girl Dreaming, which was also a recipient of the Coretta Scott King Award, a Newbery Honor, the NAACP Image Award and a Sibert Honor. In 2015, Woodson was named the Young People’s Poet Laureate by the Poetry Foundation. Her recent adult book, Another Brooklyn, was a National Book Award finalist. She is the author of more than two dozen award-winning books for young adults, middle graders and children; among her many accolades, she is a four-time Newbery Honor winner, a three-time National Book Award finalist, and a two-time Coretta Scott King Award winner. Her books include The Other Side, Each Kindness, Caldecott Honor book Coming On Home Soon; Newbery Honor winners Feathers, Show Way, and After Tupac and D Foster; and Miracle’s Boys, which received the LA Times Book Prize and the Coretta Scott King Award. Jacqueline is also the recipient of the Margaret A. Edwards Award for lifetime achievement for her contributions to young adult literature, the winner of the Jane Addams Children’s Book Award, and was the 2013 United States nominee for the Hans Christian Andersen Award. In March 2018, Penguin Young Readers will celebrate the 20th anniversary of Woodson’s If You Come Softly with a special edition of the beloved story of star-crossed love between a Black teenage boy and his Jewish classmate. The Dream of America, a middle grade novel, and The Day You Begin, a picture book illustrated by Pura Belpré Illustrator Award winner Rafael López will publish in August 2018. She lives with her family in Brooklyn, New York. The Children’s Book Council, is the nonprofit trade association of children’s book publishers in North America, dedicated to supporting the industry and promoting children’s books and reading. The CBC offers children’s publishers the opportunity to work together on issues of importance to the industry at large, including educational programming, literacy advocacy, and collaborations with other national organizations. About Every Child a ReaderEvery Child a Reader is a 501(c)(3) literacy charity whose popular national programs include Children’s Book Week, the longest-running literacy initiative in the country; the Children’s and Teen Choice Book Awards, the only national book awards chosen by children and teens; and the National Ambassador for Young People’s Literature program, in partnership with the Library of Congress. Launched in 1919, Children’s Book Week will celebrate its 100th anniversary in May 2019.